Bird confirmed Sunday that she'll be back in 2019 to play in her 17th WNBA season, Clevis Murray of The Athletic reports. Bird showed no signs of slowing down during the 2018 campaign, posting averages of 10.1 points, 7.1 assists, 1.7 rebounds and 1.1 steals across 26.6 minutes per game. The assists marked a new career high and placed her second overall in the league, while she was a key contributor in leading the Storm to a championship. 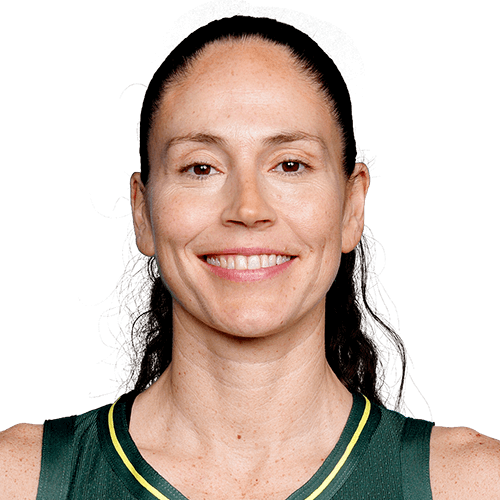 Instead of going out on a high note, Bird confirmed that she's not ready to call it quits quite yet and will be back to attempt a title defense in a Seattle uniform. Bird dropped 22 points (8-18 FG, 5-11 3Pt, 1-2 FT), five assists, two rebounds, one steal and one block during Tuesday's 94-84 playoff win over the Mercury. 14 of Bird's 22 points Tuesday came in the fourth quarter, as she was on fire from three-point range to help lead the Storm into the WNBA Finals. So far this postseason, Bird is averaging 11.6 points and 6.8 assists over five playoff games. Bird (nose) has been cleared to play in Game 5 against the Mercury on Tuesday, Andrew Joe Potter of The Score reports. Bird suffered a broken nose during Game 4, but will apparently tough it out and play through the issue in Game 5 on Tuesday as the Storm look to close out the series. She's expected to wear a mask to protect the nose and at this point, doesn't appear set to have any sort of restrictions. The Storm ended up losing by two in Sunday's contest, which means Bird will only have two days to be ready for a series-deciding Game 5. If Bird is cleared, chances are the point guard will have to wear a protective mask. Bird managed 19 points (7-13 FG, 3-6 3Pt, 2-2 FT), six assists and two rebounds in Tuesday's 91-87 playoff victory over the Mercury. Bird was much more aggressive offensively during the playoff win Tuesday, erupting for 19 points on 53.8 percent shooting while knocking down three three-point shots. This postseason, the two-time WNBA Champion is adding 14.5 points and 8.0 assists per appearance. Bird tallied 10 points (4-10 FG, 2-5 3Pt), 10 assists, four rebounds and three steals in the 91-87 home playoff win over Phoenix on Sunday. This was Bird's sixth double-double outing this season, as she managed 10 points on 40.0 percent shooting while dishing out a team-leading 10 assists in the playoff win Sunday. In the regular season this year, the 38-year-old veteran averaged a career-high 7.1 assists over 31 games played. Bird will rest during Sunday's contest against the Wings. Jordin Canada will get the start in her stead. The veteran will get the night off for the final regular-season game of the season. She'll finish the campaign averaging 10.1 points, 7.1 assists, 1.7 boards and 1.1 steals across 26.6 minutes. Bird finished with 13 points (5-7 FG, 3-4 3Pt), six assists, five rebounds and one steal across 29 minutes during Friday's 85-77 victory over the Liberty. Bird has been lighting it up from beyond the arc lately, shooting 62.5 percent from distance during August's six games. In addition to her fourth-ranked three-point percentage (44.8), Bird also is second in the league in assists per game (7.1). Bird totaled 10 points (4-6 FG, 2-3 3Pt), seven assists, four steals and two rebounds in the 96-80 road win at New York on Monday. Bird's seven assists tied the team-lead Monday while also reaching double figures in points-scored for the 16th time in 27 outings this year. The two-time WNBA Champion is so far posting 10.0 points, 7.3 assists and 1.7 rebounds per contest in 2018. Bird finished with 14 points (5-8 FG, 4-5 3Pt), 11 assists and two rebounds during Friday's 85-75 victory over Minnesota. Bird was on-target from three-point range during the win Friday, going four-of-five behind the arc while also adding once again a team-leading 11 assists. Friday's performance marked the sixth double-double of the season for the veteran. So far in 2018, Bird is adding 10.0 points and 7.3 assists per contest. In that same game on 9/1/17 at Washington, became one of only two players to accomplish a 13-assist, 0-turnover game (Jennifer Rizzotti, CLE, 14 assists and 0 turnovers, 6/21/02 vs. NYL). Sixth player to win an NCAA Championship, a WNBA Championship, and an Olympic gold medal. Led Seattle to the 2010 WNBA Championship, the first team in league history to record an undefeated slate at home in the regular season and to post a 7-0 run to the title. One of eight players to have earned an NCAA title, WNBA title and Olympic Gold Medal (Swin Cash, Cynthia Cooper, Maya Moore, Ruth Riley, Sheryl Swoopes, Diana Taurasi and Kara Walters).